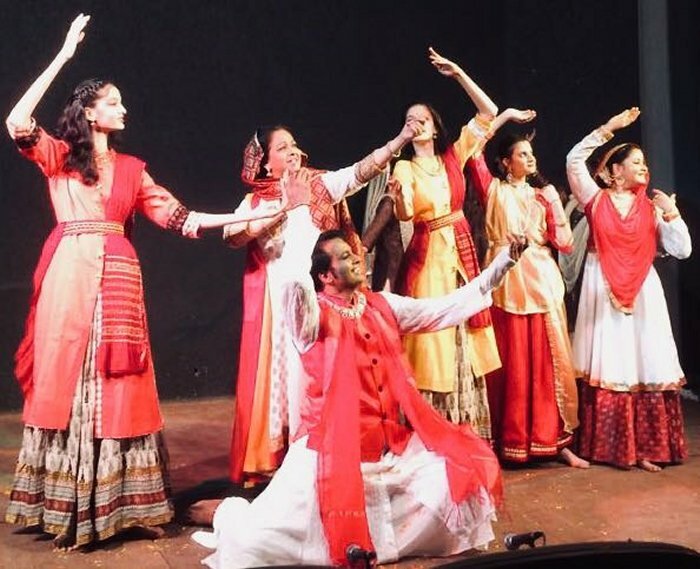 A colourful, florally decked evening of Kathak was presented by Kalashram Mumbai - Hori Aayi Re! directed by Guru Renu Sharma. The event held on March 4 at SPJIMR Auditorium, Bhavan's College, Andheri West, Mumbai, was befitting the theme of Hori. The spectrum was resplendent with traditional hori compositions by Pandit Birju Maharaj, Meerabai and Astachaap poets. The colours were interwoven by Shruti Vaidya in her iconic style of short stories that served as a prelude to all the performances. Her narrative drew an outline while the dance that followed completed the picture. The young dancers in bright earthy shades and minimal accessories performed Guru Vandana and rangmanch pravesh. Kasturi Tilakam, salutations to Gopala who is adorned with the sacred marks of Kasturi (Musk) on his forehead and Kaustubha jewel on his chest was presented by Sunil Sunkara. The act appeared to be a celebration wherein Krishna was smiling in the middle surrounded by the cowherd women. The mood was upswing with Revathy and group presenting holi khelat hai Giridhari. While they enjoyed the colours, the promise of romance filled the air in the form of baat chalat nayi chunari rang daari presented by Trupti Chiwukula, a popular composition of Kunwar Shyam. Her expression and placements made one feel the subtle presence of Krishna doting on her moves. Next was Navavasant, an astachaap composition by Antara and Tanvi followed by beeta shishir vasant hai aaya, a new age poetry composition by Uma Trigunayat set to tune by Kartik Raman. On the occasion of Holi, the Abhang "Abeer Gulaal" by Sant Chokhamela, meaning fragrant colour powder took the audience to a new high. The Bhaktirang Sunil Sunkara portrayed on vocalist Manas Vishwaroop and Kartik Raman's music lit up the atmosphere in divinity. The best of the evening was 'Taal astamangal', a scintillating nritta piece with high speed and demanding rhythm. The notes on sitar by Alka Gujar, vocals by Somnath Mishra, tabla by Amit Mishra were in absolute synchrony with the bells of the dancer. The tishra jati amad, tihai, natwari paran with alternated rhythm, wove themselves into varying formations. The gat bhaav on horika- prahlaad that followed drew applause for each move. The tempo was set for a darbari tarana rendered by Antara and group set by Maharaj himself. The moves were poetic and the footwork was very well coordinated. The nazar ka sher by Trupti, tu zudaa bhi hai tu mila bhi hai had some stylistic moves and shades of ada in it. The abhinaya on Chaap tilak, a notable composition of Amir Khusro by Sunil left the audience awestruck. The costume, with the sufi colour to the choreography added a oneness with the spiritual mentor. The chakkars and expression just gave away the essence of, "I give my whole life to you Oh, Nizam, you've made me your bride, by just a glance". The evening moved from visual to aural through the performances to end with intonation of bols, soft footed celebration of Holi to the bol of aaj rang by Guru Renu Sharma. It brought all the artists to the fore and ended with beautiful live colours, flower petals on the audience completely immersing them in the colour that was Hori ke Rang. Dr. Anupma Harshal is a Research Scientist in Biology and has been trained in Kathak dance by late Pandit Brijraj Mishra.